We carry over 7,800 different vacuum tubes, in Stock! 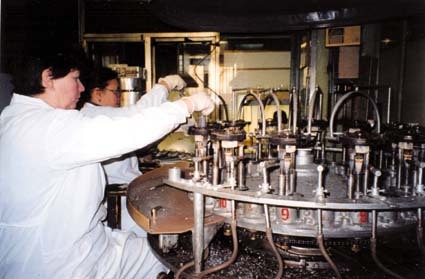 12 Million tubes on hand every day! See my cover article about the growth of modern tube audio, in the August 1998 issue of IEEE SPECTRUM magazine. It is available online at http://www.spectrum.ieee.org/select/0898/tube.html, and will shortly be available on the Svetlana website as technical bulletin number 39. For more information about why tubes are still used in high-power and high-frequency RF applications, see the article by Robert Symons in the April 1998 issue of IEEE SPECTRUM, page 52. Bias is a negative voltage applied to a power tube's control grid, to set the amount of idle current the tube draws. It is important to bias a tube to stay within its rated dissipation. Otherwise, you DO NOT need to worry about small deviances from the manufacturer's recommendations. Many times we have customers asking us things like, "I replaced the tubes, the old tubes ran at 35 mA, the new ones run at 38 mA. I'm worried that I have to rebias the amp." This is NOT worth worrying about. Especially with guitar amps--they tend to run their tubes at idle conditions which are conservative. Some high-end audio amps run their power tubes quite hard--in that case, rebiasing is necessary. Many amps have no bias adjustments at all, and are designed so that you do not need to concern yourself with bias. This includes most Mesa-Boogie guitar amps, most amps using EL84s, and many single-ended triode hi-fi amps. See our Technical Bulletin #7 for more information on biasing guitar amps. We suggest that users consult with the equipment manufacturer, if possible. Practically speaking, you should only replace tubes in an audio amplifier when you start to notice changes in the sound quality. Usually the tone will become "dull", and transients will seem to be blunted. Also, the gain of the amplifier will decrease noticeably. This is usually enough of a warning for tube replacement. If the user has very stringent requirements for observing tube weakening, the best way to check tubes is with a proper mutual- conductance-style tube tester. These are still available on the used market; though new ones have not been manufactured in many years. One tester is being manufactured today, the Maxi-Matcher. It is suitable for testing 6L6, EL34, 6550 and EL84 types. If you cannot get your own tube tester, speak to a service technician for his recommendations. 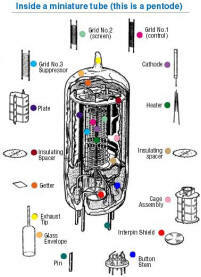 See our cathode section 2A above for some idea of typical lifetimes for tubes. SRPP circuits and mu-follower circuits are special designs which use a lower tube (for gain), and an upper tube which serves as the plate load for the lower tube. The upper tube also acts as both a cathode follower and as a constant-current source for the lower tube. If properly designed, either circuit can offer improved performance over an ordinary resistor-loaded tube stage. These circuits are used only in preamp stages and in the driver stages of power amps, usually SE types, in high-end audio. If you want to build your own, see Technical Bulletin 27 for a good-quality mu-follower circuit that can be used as a line stage preamp or a power-amp driver.